CHEONAN, Korea, Oct 20 – Rory McIlroy of Northern Ireland in action on Sunday 20 October, 2013, during the final round of the Kolon Korea Open at Woo Jeong Hills Country Club. Picture by Paul Lakatos/OneAsia. Rory McIlroy stamped his class on the Kolon-Hana Bank Korea Open today by firing a four-under-par 67 to take a share of the third round lead with former winner Kim Dae-sub, the OneAsia Tour reports. 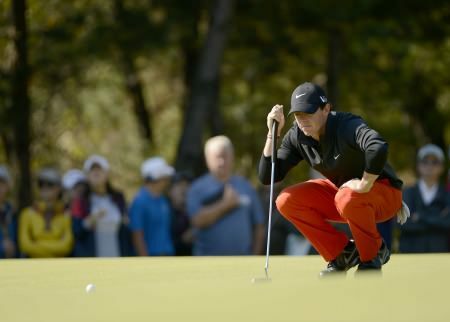 McIlroy, whose pure golf swing has helped establish him as the world’s finest young golfer, made five birdies in a row starting from the second hole. He one putted the first seven holes to help put him in position to win what is the second tournament of the year on the OneAsia Tour. The 20 year old, world ranked 24 and winner of this year’s Dubai Desert Classic, holds joint top spot with a three-round aggregate of seven-under-par 206. Kim, the former golf prodigy who shot to fame by winning his national Open twice as an amateur in his teens, came in with a 69. The 28 year old led for much of the day but dropped a shot on the 17th. The Korean first claimed the title in 1998 when he was 16 and then again in 2001 aged 19. Defending champion Bae Sang-moon from Korea is one shot behind after returning a 65 at Woo Jeung Hills Golf Club, which is about an hour outside of Seoul. Overnight leader Michael Wright from Australia finished three behind the leaders after carding a 76 while Japanese wonder kid Ryo Ishikawa shot a 72 and is five behind. “Obviously I had a great start today. You need to start well on this course. If I can get to four or five under on the front nine I will have a chance. I am driving the ball really well,” said McIlroy. He had a poor back nine and dropped shots on 10 and 12 but drained a 10 foot birdie putt on the par five 18th. Kim, who turned professional immediately after winning the Korea Open in 2001, made five birdies, including four in the first six holes, and three bogeys. After his two Korea Open victories great things were expected of Kim but he was unable fulfill his potential. “Things did not quite go according to plan when I turned professional but I have had some success and if I can play well tomorrow it will really be wonderful,” said Kim. Ishikawa, who was paired with McIlroy, was unable to make any headway and made an eagle, one birdie, one double bogey and two bogeys. “It is a bit frustrating to finish one over especially as I started well with an eagle on hole five. I can still win with a low round tomorrow. I am making too many mistakes at the moment,” said the 17-year-old Ishikawa, who won the Fujisankei Classic last weekend for his fifth victory in Japan. 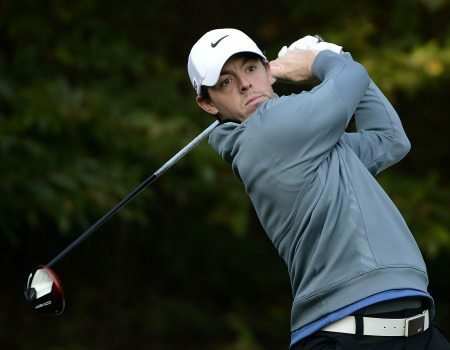 Rory McIlroy trails teen rival Ryo Ishikawa by a shot after a first round comeback in the Kolon Hana Bank Korea Open. Rory's new Twitter image was produced by aindreas.com. Is he a new gay icon we wonder?The Holywood native, 20, matched New Zealand young gun Danny Lee when bounced back from three over after eight holes to card a level par 71 at Woo Jeong Hills Country Club near Seoul. Twittering from Korea, McIlroy wrote: "3 over thru 8 but finished at even so a pretty good come back even tho i bogeyed the last! but only 4 behind so still in good shape!"